It was the bottom of the 9th, the bases were loaded, there was a full count and one run separated the two teams. Around 1,500 spectators filled the stands of the Lenox Oval in uptown New York City, and on this particular, Sunday, they were no doubt on the edge of their seats. The pitcher began her wind up — and a cop walked onto the field to hand the third baseman a subpoena. That’s how a scrimmage game between the “Reds” and the “Blues” ended, according to an account in the New York Tribune. The game, which took place May 25, 1913, is one of the few publicized outings of New York’s female Giants. Historians don’t seem to know much about this short-lived, unofficial female counterpart to the popular men’s baseball team of the time, Greg Young and Tom Meyers write for their popular New York City history blog/podcast, The Bowery Boys. Amateur girls baseball teams date to as early at 1866, long before candy honcho Phil Wrigley launched the All-American Girls Professional Baseball League (dramatized by A League of Their Own) in the 1940s. Dubbed “Bloomer Girls” for the baggy Turkish-style trousers they’d wear during games, these teams became particularly popular in the late 1890s and early 1900s. They typically challenged local men’s teams to games. Some men played alongside the women, possibly donning female clothing and masquerading as girls. Meyers and Young point to a 1913 game in Washington, D.C., when fans stormed Union Field after an outfielder threw the ball from deep center to home plate, supposedly revealing himself to be a man. Historian and photojournalist Michael Carlebach pins the conception of this particular New York team on the shoulders of then-Giants manager John McGraw. Some of the girls were trained baseball players recruited from local high schools, while others came from other sports. Ida Schnall served as their captain and had a background in swimming and diving. 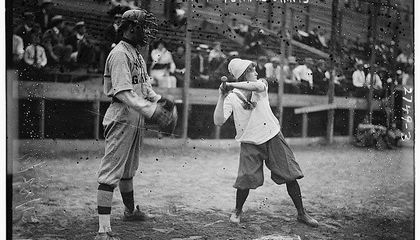 The U.S. Olympic Committee had barred women from competing in the 1912 games in Stockholm, Sweden, so she decided to try her arm at baseball. The infamous May 25th game at the Lenox Oval, a sporting arena at the corner of 145th and Lenox Avenue, was supposed to be an exhibition scrimmage where the team split up into two squads, the “Blue Stockings” and the “Red Stockings,” and played each other. When things got exciting at the bottom of the 9th inning, Schall was pitching, but she never got to finish the game. Under New York law, teams weren’t allowed to sell tickets to games on Sundays, but a policeman had caught the third baseman, 17-yeard-old Helen Lenker, selling programs before the game. The cops shut down the game and ordered her to appear before a judge in Harlem. Lenker explained that she had simply been handing the programs out, when spectators (including the policeman) started giving her money of their own avail. Though the New York Tribune alleged that she had charmed her way out of the predicament, the next day the judge dismissed the charges. The game likely received press coverage because the cops showed up, Meyers and Young posit. 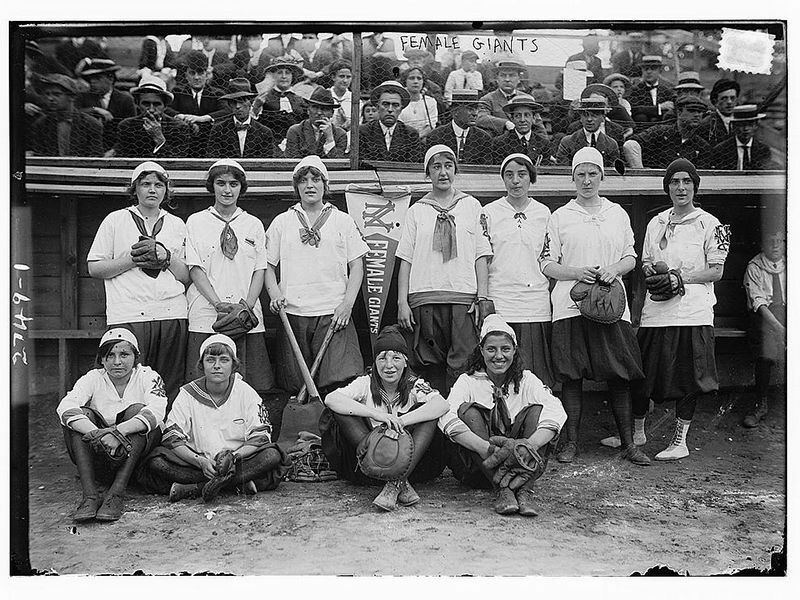 There’s some evidence that the female Giants played against and with members of the men’s New York Giants team — none appear to be wearing disguises. The team lasted about a year. While the female Giants only took the field in 1913, “Bloomer Girls” teams remained popular until the 1930s. Why do you think little is know about these amateur women's baseball teams? I liked reading this because I like to see or read things about women doing things that "we shouldnt". Considering I have a big interest in softball and baseball, I enjoyed this article.